The person in front of me is finishing their transaction so I’m up next. I told her not to worry about getting the cheap toilet paper for me. In my mind I’m thinking a) I don’t want to make her go get it, b) I’m worried she won’t get back in time and I’ll be left standing there waiting for her and c) because IT’S CHEAP TOILET PAPER (and I know its quality is going to be sorely lacking for a penny). She insisted I have it and, as I’ve talked about before, I don’t play the “Take This-No Thank You-I Insist” Game very well. So after several back and forths about whether she would get it or not, I finally relented. She zipped off and within seconds (it seemed) was back grinning from ear to ear. She had with her my penny item – a four-pack of the cheapest, 1-ply, generic toilet paper you can possibly imagine. I thanked her for her kindness and proceeded to check out. It had been a very sweet gesture and I was appreciative of her thoughtfulness, even though I’d never buy that product for myself. In our house we use Charmin Ultra Soft toilet paper. I usually purchase the Mega Roll – a ginormous 16-pk. monstrosity of a package that best fits in the rack under the shopping cart. At our Publix grocery store it retails for $21.99, which translates to $1.37 per unit price. The softness of the 1-ply, penny item toilet paper with a unit price of $.0025…not so much. Made going to the bathroom, well…enough said. This may be “T.M.I.” but I just wanted to be clear we actually did use the item until it was gone. Might as well have used sandpaper. Odd thing is though I didn’t hear anyone in the family complaining about the radical change in toilet paper. They just went about their business (haha) as usual. Which made me think, at least for a moment, why I’m spending so much on toilet paper when a cheaper alternative is available that no one seemed to mind. I know the generic, 1-ply brand doesn’t always retail for a penny but even its regular price is significantly cheaper than what I’m buying. I mean it is just toilet paper. Do I really need to make that daily experience more pleasurable with the gently comfort of Charmin Ultra Soft? It all ends up in the same place, right? I don’t know if I’ll make the switch. However, the experience reminded me again of the importance of analyzing purchases. Personal motive, price, purpose and outcome are all essential elements to consider when buying any product, even if it’s toilet paper. After analyzing those factors you may find the more expensive item really isn’t worth it. Questions: What would you do…should we switch to cheap toilet paper to save money? What type of toilet paper do you use? Do you regularly search out penny items? Do you ever find it frustrating when people insist you take something? I personally have a minimum preference of 2-ply. I don’t mind paying the extra money. I personally use the cheap brand of toilet paper, but I also use disposable wet wipes as well. Not because the cheap toilet paper doesn’t work, but because I like the clean feeling from the wet wipe – sorry if that is too much information!! My wife thought likes the 2-ply stuff and won’t use the cheap stuff, and I’ve tried to get her to like it. At the end of the day, though, when you take into account the cost of the wet wipes, I am probably spending the same as if I were buying more expensive toilet paper. “…things in life I don’t compromise on…” Seems like that’s the big consensus here. Funny that this is one of those things. What? You mean you don’t make your own TP? The FrugalPolice are gonna come knockin’ at yer door! Haha…I’ve heard of that. Just reading how that process works is scary. Don’t think so. Ha! One time we purchased mega cheap toilet paper, it was so bad that we donated it to a charity thrift shop. I dunno, maybe we should have thrown it away? Never again. At least you didn’t throw it up in someone’s trees. Hehe…that was our old high school go-to prank. I use enough of that 1-ply toilet paper at work. It’s awful, absolutely terrible. I’ll stick to using the nice stuff while I’m at home haha. Someone else in my social media circle mentioned that today. I’ll give it a look. We have a septic tank, and one ply is actually recommended. I’ve been using Charmin Basic for years. It’s soft, just not as thick as the 2 ply. It’s great for little kids because they use way too much and the thick stuff clogs up the toilet. I would not buy the generic. Tried that and it was not pleasant, although the Kroger brand is not horrible. If Charmin Basic is not on sale, I’ll buy that for our daughter’s bathroom. That would crack me up if a lady insisted on getting toilet paper for me. This whole post cracks me up. I don’t believe I’ve though this much about toilet paper ever! Kim recently posted…Do You Need A WiFi Refrigerator? I’ve heard that about one-ply for septic tanks. We’ve never had a problem at our house with that. Kid’s using too much on the other hand…yes, we’ve been there. LOL! What a funny article. I used to use the cheapest toilet paper, until my husband bought the Charmin Mega Roll (He could care less about saving money). This brand lasted us so long that I think it’s cheaper and time saving in the long run. That’s a good point Yvette. The Mega-roll does last a long time. It’s bigger than the traditional roll…and you get 16 of them. Even with six in the house I’m only buying it about once a month. Tonya recently posted…Should College Athletes Get Paid? We do have a true dollar store nearby. I should at least go check out what they have there. Maybe I’ll be surprised by what they stock but I doubt it. This post makes me smile! 🙂 Isn’t it funny how some things you really do have to consider quality for. I will go “pretty cheap” for toilet paper, as in not the best / softest, but I also don’t get the cheapest because of how bad it is! This is one item I’m definitely shopping middle of the road for. “… have to consider quality…” I don’t even think we used the cheap-one ply stuff back in my teen years when we were out toilet papering people’s houses. You couldn’t throw it up in the trees with it ripping. Is that still done? When I find deals like this where I don’t necessarily need or use the product, but know that it is useful to someone, I’ll buy it and set it aside as a contribution to local food drives. Just last month I took a few of my students to help at a local food bank and was surprised to find out that they provide items such as toilet paper and other necessary non-canned food items to their clients. I was glad to learn something new. Stores in my area never have a 1 cent offer like yours obviously do, but I”ll be on the lookout nonetheless. “…set it aside as a contribution to local food drives.” I think that’s a great idea Karen. Back in our more broke days we went with the cheapest thing we could find. These days we go with better stuff. Usually Charmin or something similar. You get what you pay for in this department! Dee recently posted…Debt is Not Forever! I guess the cheap stuff is catering to a market or else it wouldn’t be produced. I typically just choose whatever’s cheapest among the 2- or 3-ply varieties. I used 1-ply while living in Fiji and…I guess you already experienced it so I don’t need to elaborate. Yes…I get it…no elaboration needed. Brian recently posted…Would You Use Cheap Toilet Paper For a Penny? 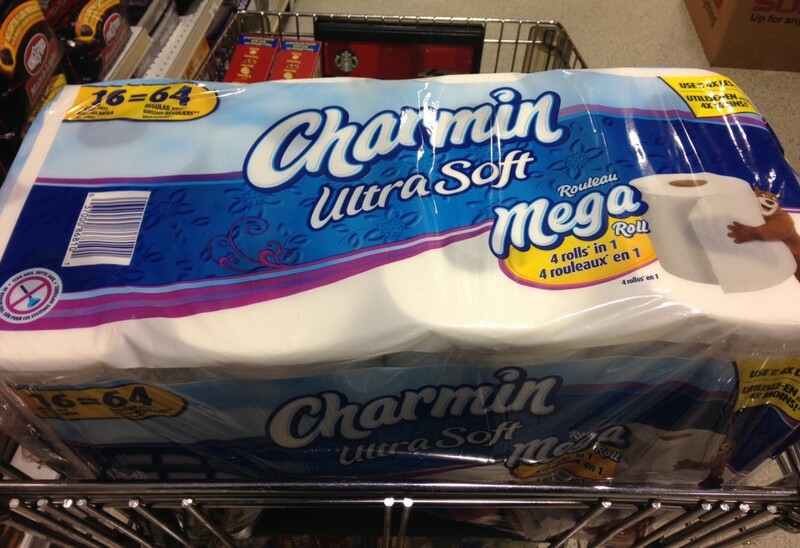 We are Charmin Ultra Soft people and toilet paper is not an area in my budget that I care to skimp on. There is nothing worse than going to a public restroom that has cheap/uncomfortable toilet paper that I really have no intention of bringing that experience home. “…public restroom that has cheap/uncomfortable toilet paper…” I know. Just once…ONCE…I’d like to go into a public restroom and see them be using a Charmin-level product. That would be awesome! We use Charmin Ultra-strong and generally get it from Target. They frequently have good sales and we combine that with a coupon to save a few more pennies. Pus, they frequently give you a $5 gift card in return for purchasing 2 of the multi roll packs on sale. All total, it often gets the price per roll under a $1. We once used one ply which was labeled safe for septic tanks but since we are now on a municipal sewer system we don’t have to do that any more. If I’d been in your situation, I’d have done just what you did. Let her get it for you and then donate it to a food bank or sometimes the stores even have bins where you can deposit a donation. I may do some shopping around on this item…sounds like you are getting a better deal than I am. I can only imagine being in the middle of that experience, lol. I wouldn’t switch to one ply…there are some things I’m willing to pony up for. 🙂 We did actually just switch from Charmin to the Kirkland brand as it saves us about $8 on the mega pack and we don’t notice too much of a difference and is still nice and soft. Funny story…when Nicole had our first the hospital had the absolute worst tp ever! I swear it was used sand paper. Suffice it to say with our other kids we took in our own tp as she pretty much ordered me to, lol! John recently posted…Personal Capital Review: Manage Your Finances For Free! It was awkward but she was really sweet about it. I know she was only trying to help. I really couldn’t say no without being ugly. I personally don’t mind the one ply. That’s what they have at work and I use no problem. At home, though, we use charmin as well because the lady can’t do (doesn’t want to do) the rough stuff. I keep reminding her that my grandma used a corn cob and didn’t complain much. But she counters with the fact that she has to use more paper with the 1-ply and I have to agree. LOL…oh no, let’s not go back to corn cobs! Can’t imagine that. Oh no! One ply is no good for our household. I don’t care about brand and will buy what’s on sale, but there is no way I’m going to be wiping with stuff that feels like sandpaper and is barely held together. Nope! Haha…I’m with you. You have to fold the one ply over anyway and create your own double-ply when using it. With that process you may end up actually using more. I think we got Kirkland a time or two when we had our Costco membership. The Kirkland brand has many quality items. We’re not super brand loyal for TP, but it’s got to be two ply quality stuff. The one time Mr PoP brought home Publix one ply (proud of himself for being frugal!) we had to suffer through those 4 rolls and it wasn’t great. So we buy sales and use coupons to cut the cost but not the quality. I wasn’t too thrilled with the Publix one ply. But no on else seemed to matter. I will probably look into using coupons for this and not worrying about brand loyalty so much.